A water jet cutter, also known as a waterjet, is a computerized tool capable of slicing into metal or other materials (such as granite) using a jet of water at high velocity and pressure, or a mixture of water and an abrasive substance. The process is essentially the same as water erosion found in nature but greatly accelerated and concentrated. It is often used during fabrication or manufacture of parts for machinery and other devices, but its capabilities are endless. It is the preferred method when the materials being cut are sensitive to the high temperatures generated by other methods. It has found applications in a diverse number of industries from mining to aerospace where it is used for operations such as cutting, shaping, carving, and reaming. Water jet is considered a “green” technology. Water jets produce no hazardous waste, reducing waste disposal costs. They can cut off large pieces of reusable scrap material that might have been lost using traditional cutting methods. Parts can be closely nested to maximize material use, and the water jet saves material by creating very little kerf. Water jets use very little water (a half gallon to approximately one gallon per minute depending on cutting head orifice size), and the water that is used can be recycled using a closed-looped system. Waste water usually is clean enough to filter and dispose of down a drain. The garnet abrasive is a non-toxic natural substance that can be recycled for repeated use. Garnet usually can be disposed of in a landfill. Water jets also eliminate airborne dust particles, smoke, fumes, and contaminants from cutting materials such as asbestos and fiberglass. This greatly improves the work environment and reduces problems arising from operator exposure. 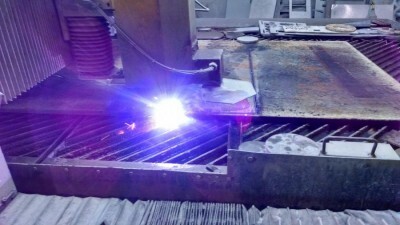 For more on waterjet cutting visit: www.waterjets.org. Listed below are some of the materials Voigt’s Sheet Metal can cut in thicknesses up to 3 inches and to within +/- .005 accuracy. With water-jet technology and the experience at Voigt’s Sheet Metal any cut can be made. Our water-jet has the capability to cut up to 3 inch thick steel, and with the experience here behind it, it is able to make the most delicate, precise, and accurate cuts as well. Starting with your largest industrial needs, all the way down to the most delicate artwork call Voigt’s Sheet Metal.